This week Alabama Trucking Association leaders were at the nation’s capital for Call on Washington, a legislative affairs program of the American Trucking Associations that affords state trucking association executives, leadership, business leaders, and staff an opportunity to discuss legislation and regulations affecting the industry with Members of Congress, key congressional staff, federal regulators, and fellow industry leaders. ATA has participated in the program the past two years, sending dozens of members who are constituents in key Alabama Congressional districts. This year’s delegation included ATA Chairman Fenn Church; Gary Bond, Past Chairman and Board Director; Greg Brown, Past Chairman and State Vice President to the American Trucking Associations; Joe Donald, Board Director; Wesley Dunn, Board Director; Beau Holmes, Board Director; Terry Kilpatrick, Immediate Past ATA Chairman and Board Director; Barry McGriff, Past Chairman and Board Director; Danny Smith, Board Director; Harold Sumerford, Jr., National ATA Vice Chairman and Board Director; Bo Watkins, Board Director; Collins White, ATA Foundation Officer and LEAD ATA member; and Frank Filgo and Ford Boswell of the ATA staff. With the House of Representatives in recess until after the November 6 mid-term elections, most House members were back home for the break; however, the Senate was still in session working on major to-do list items, including funding for the federal government and, of course, confirming Judge Brett Kavanaugh to the Supreme Court. After a briefing for key issues and talking points from National ATA’s Legislative Affairs and Lobbying team, the group spent two days on Capitol Hill pounding the pavement between the Russell Senate Office Building, the Cannon House Office Building, and the Rayburn House Building visiting with top staffers for Rep. Bradley Byrne; Rep. Gary Palmer; Rep. Mike Rogers, Rep. Martha Roby; Rep. Terri Sewell; and Sen. Richard Shelby. 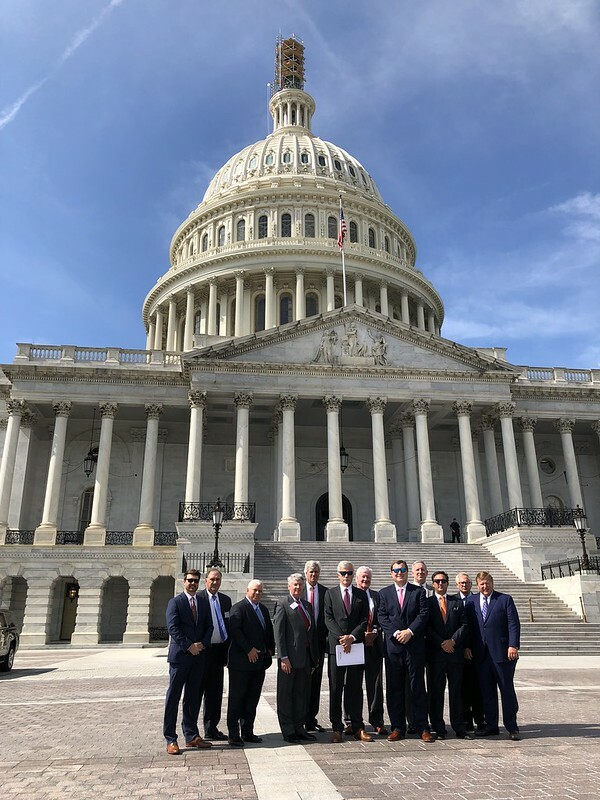 ATA leaders met face-to-face with Sen. Doug Jones and Rep. Robert Aderholt for Alabama’s 4th District to express trucking’s key concerns and support for various legislation. Jones, a junior Democratic Senator from Birmingham, won a special election last year to replace the seat vacated by current U.S. Attorney General Jeff Sessions, while Rep. Aderholt has served his district since 1997. Both men had an impressive grasp of issues facing trucking, and the group specifically highlighted transportation infrastructure funding, which the trucking industry has been on record for years in support of sustainable, long term funding for the federal-aid highway program through increased fuel taxes at both the state and federal level. The group also promoted measures for workforce development, including H.R. 3889, which expands the FAST Act pilot program for interstate truck drivers to include drivers under 21 with previous military experience and civilian drivers under 21 who have a CDL and meet other minimum qualification standards. ATA leaders further described the industry’s support for the creation of an apprenticeship program that would train 18-21-year-old CDL holders to drive trucks in interstate commerce. ATA supports efforts aimed at reducing states’ CDL skills-testing delays and creating career pathways in trucking for veterans and youth who are neither in school or work. Other topics covered included autonomous vehicles and platooning technology. ATA Chairman Church said that National ATA’s Call on Washington was created to help educate elected officials on important matters for trucking.